Aging is difficult, whether you’re human or canine. Luckily, we live in a day and age where there are plenty of products to help our furry kids feel better as they age. At what age is a dog considered “senior,” anyway? It depends on your dog’s size and breed. On average, dogs are considered seniors at 7. Giant breed dogs are considered seniors at the age of 6. Toy breeds may not be considered senior until they reach 10 years old. Of course, these are just general guidelines, and if your dog has any ongoing health conditions, that could make them feel like a senior sooner. With that in mind, here are 5 things you should give your senior dog to make them happier and healthier. Most commercial dog foods don’t contain enough omega-3. Omega-3 can go rancid pretty quickly, so even if it survives the high-heat cooking process required to make the food, it may go bad before ever reaching your dog. Omega-3 supplements have been shown to make a world of difference in the health of senior dogs. 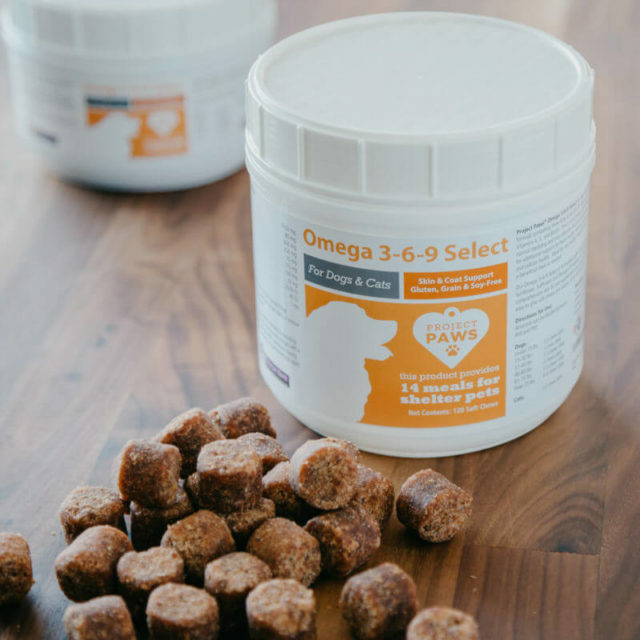 Project Paws® Omega 3-6-9 Select Chews were formulated by veterinarians to provide an unparalleled boost to your dog’s health in the most natural, sustainable way possible in a supplement. The chews contain essential omega-3, omega-6, and omega-9 fatty acids, including EPA, DHA, and GLA – one of the only supplements offering GLA! The grain-free, gluten-free, and soy-free formula is made from sustainably-sourced krill, which has a longer shelf life and contains lower levels of mercury than salmon, which most other omega-3 supplements are made from. Each purchase feeds 14 shelters dogs. As dogs age, they are prone to achy joints as the result of arthritis or hip dysplasia. Glucosamine and chondroitin can provide protection for cartilage, which may ease the pain of arthritis or hip dysplasia. One study showed that supplements with glucosamine and chondroitin offered a “moderate level of comfort” on par with some prescription drugs for dogs suffering from arthritis. 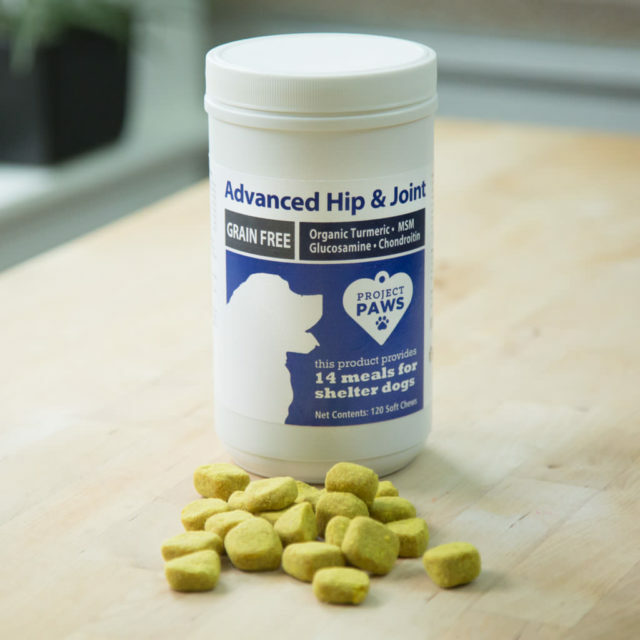 Project Paws® Hypoallergenic Hip and Joint is a powerful soft chew for dogs supporting normal joint function, flexibility, and healthy joint cartilage. It’s formulated with a complete and balanced blend of glucosamine, chondroitin, MSM, creatine, turmeric, boswellia, hyaluronic acid, vitamins, minerals, and omega fatty acids in a great tasting chew that dogs love! The cold-press extrusion process maintains more nutrients than other methods of creating supplements. Also, each purchase feeds 14 shelter dogs. 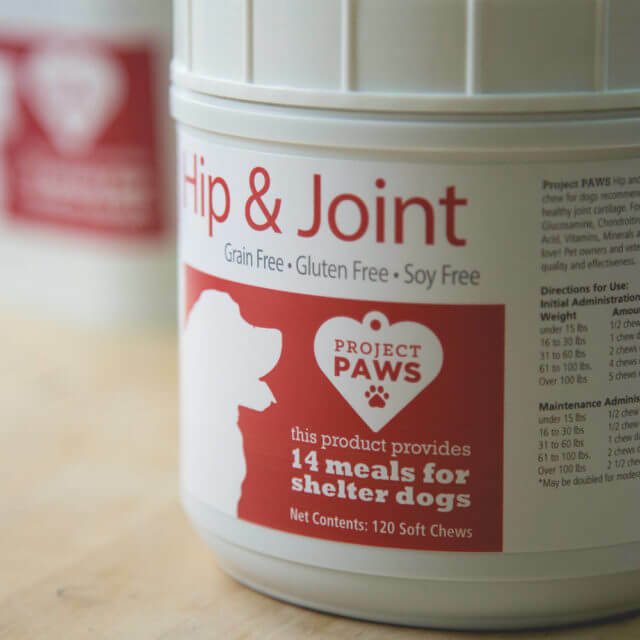 Project Paws® Advanced Hip & Joint has all the benefits of the Hypoallergenic Hip and Joint formula, but it also includes a great bacon flavor your senior dog will love as well as black pepper extract and yucca schidigera for additional reductions in painful joint inflammation. It’s grain-free and all-natural with no added salt, sugar, or artificial flavors or colors. 80% of dogs show signs of periodontal disease by the age of 4. Once your dog has become a senior citizen, dental health becomes a much bigger concern. Failing to care for your dog’s teeth has further-reaching consequences than just tooth loss – bacteria that proliferates under your dog’s gum line can actually invade your dog’s bloodstream and affect his internal organs. Dogs can be a lot more sensitive about their mouths as they age and they may start to refuse toothbrushing. You still need to care for your dog’s oral health, though. What can you do? 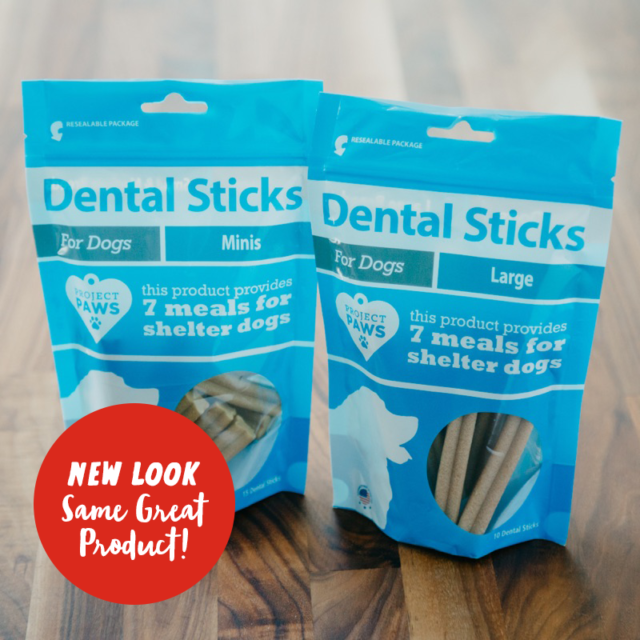 Project Paws® Triple Enzyme Dental Sticks are the perfect solution. It’s a treat for your dog that also helps clean his teeth and stimulate healthy gums. Developed by veterinarians and proudly manufactured in the USA, the natural abrasive cleansing action of the tasty Dental Sticks combined with our proprietary triple enzyme source, peppermint, and the flavonoid curcumin, helps to support periodontal health. The 3 enzymes (lysozyme, lactoferrin, and lactoperoxidase) either alone or in combination with each other offer excellent dental health benefits such as reduction in plaque due to their antimicrobial properties. In addition, we have added curcumin, which is clinically proven to play an important role in helping to prevent periodontal disease both in humans and canines. Each purchase feeds 7 shelter dogs. Bone broth has a wide variety of benefits for your senior dog including immune system support, healthy digestion, glucosamine and chondroitin (which are great for joint health), and minerals. Spending all day boiling bones and leaving your stove unattended just isn’t convenient for a lot of people. 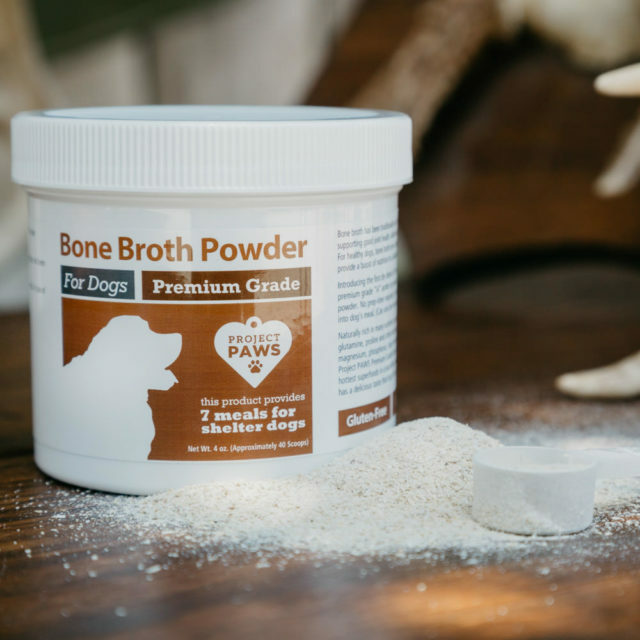 That’s where Project Paws® Premium Grade Bone Broth Powder comes in to save the day! This unique formula is naturally rich in many nutrients, especially amino acids, such as arginine, glycine, glutamine, and proline, and other nutrients, such as thiamine, potassium, zinc, calcium, sulfur, magnesium, phosphorus, trace minerals, and glucosamine and chondroitin sulfates. No need to spend all day boiling bones. Just add a scoop of this powder to your senior’s food for an easy way to get great results! Each purchase helps feed 7 shelter dogs. Did you know that your dog’s pancreas isn’t designed to create all of the digestive enzymes he needs to digest his food? Wolves supplement their digestive enzymes by eating the entrails of their prey. Since we don’t feed our dogs entrails, most dogs are enzyme-deficient. As your dog ages, his pancreas can become overworked and starts producing even fewer digestive enzymes. Has the texture and consistency of your dog’s poop changed recently? He could probably benefit from a probiotic and digestive enzyme supplement. Pronine™ Flora 4-in-1 Canine Probiotic, Prebiotic, Digestive Enzyme, Herb Supplement is the most complete digestive supplement available for dogs! Containing probiotics, prebiotics, digestive enzymes, and herbs, this digestive supplement is an excellent way to ensure your pet maintains a healthy level of the good bacteria essential in the gut to promote and support overall colon and bowel health. 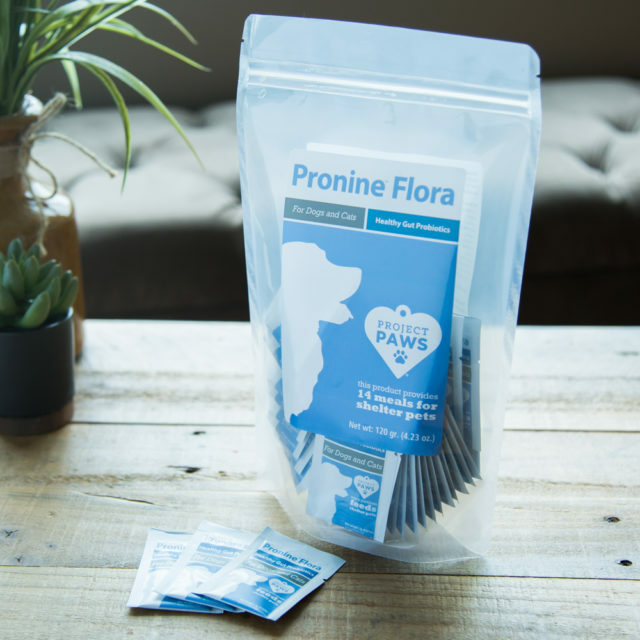 Project Paws® Pronine™ Flora aids in the absorption of essential nutrients, while nourishing the natural gut flora for complete GI health. Each purchase provides meals for 14 shelter dogs! Did you know that you can have your favorite Project Paws® supplements shipped to you on a regular schedule? 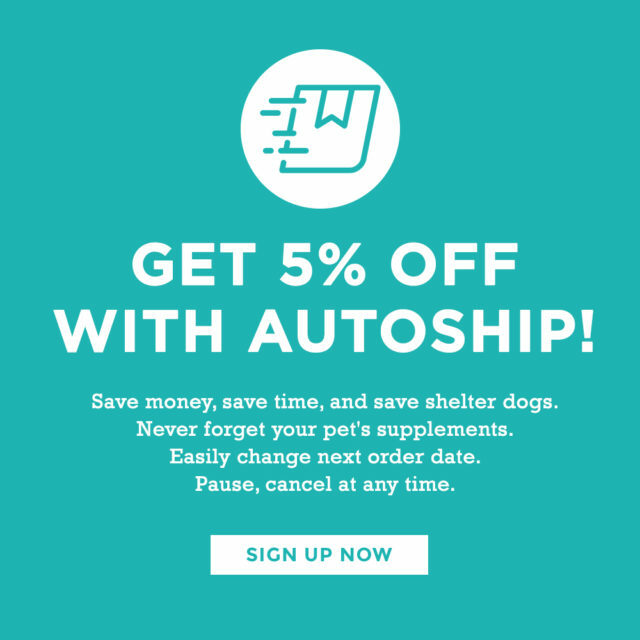 You save 5%, never run out of the supplements your senior dog needs to keep him healthy and happy, and help feed shelter dogs in the process. You can easily adjust your AUTOSHIP subscription at any time.